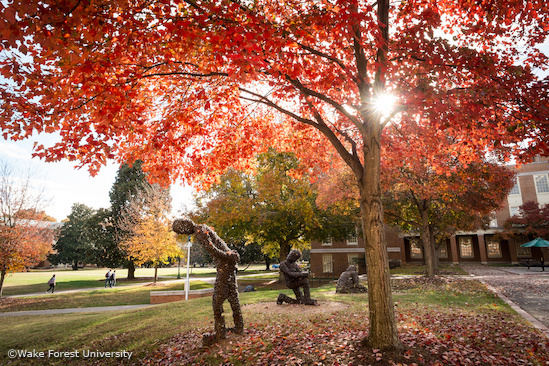 Located in the hospitable city of Winston-Salem, North Carolina, students have ready access to affordable housing near campus, exciting collegiate and professional athletics, many cultural and musical events, and numerous parks and facilities for outdoor pursuits. Graduates typically live in apartments near campus and enjoy a low cost of living. Wake Forest University owns several properties within close proximity to the campus, many of those are at walking distance from campus. These houses are completely furnished and graduate students can rent a room. More information on Wake Forest owned off-campus housing. In close proximity to campus and also served by University shuttle services, you can find a number of non-university owned houses, rooms, and apartment complexes that students can rent. More information on non-university off-campus housing.